Christian and Martin are two very different characters. While Christian is calm and pensive with a critical approach to design – Martin often charges ahead with lots of ideas and temperament. These differences in skills and personality are definitely the characteristics that make this collaboration strong and dynamic. The design approach of the Noergaard-Kechayas is problem solving by nature and aims to offer strong visual appeal with innovative technical solutions. Noergaard-Kechayas collaborate with new and established companies, such as: Abstracta, Hay, Munk Collective, Nevvvorks and Stolab, amongst others. 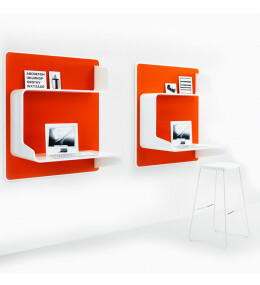 Wall in One is a playful wall mounted workstation for places with a high degree of mobility.